There are so many different types of model train sets out there today. So if you’re looking at getting into the hobby, or if you’re getting a gift for someone who is a model train enthusiast, how do you know which type of set to choose? 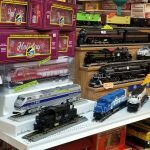 Here’s some information to help you select the right model train set in Ewing, NJ. All model trains are made to a specific scale—the proportion of the prototype to the real train. There are standards in the model train industry to ensure that all trains, tracks and accessories within the same scale will operate together without issue. So, for example, if you purchase an HO scale train set, you should be able to buy extra HO cars or accessories and not have to worry about them matching the items you already have. How do you determine which scale is right for you? It’s really a matter of personal preference. Some people like smaller scales, like N scales, because they can make smaller layouts. Other people like the larger O gauge trains in Ewing, NJ, as they have easier handling. Until very recently, train sets typically had a single basic power pack, providing enough power for the train and a few extra accessories. There are now more power supply options that allow model train enthusiasts to have greater control over their sets. One example is Digital Command Control, or DCC. DCC provides independent control of multiple trains at once without having to worry about much in the way of layout wiring. This is one of the fastest-growing areas for model train enthusiasts. It has been particularly common with HO trains, but similar options are appearing in O gauge trains as well. Most of the common scales come with integrated roadbed tracks, which are tracks that have raised plastic bases. This is a newer type of track that is ideal for beginners, especially children, and also for temporary layouts that are set up on just about any type of surface. They combine realism and versatility. Their only disadvantage is that they are not compatible with all types of trains and accessories. You can find some universally compatible train tracks, but they often don’t come standard with train sets, so you might need to do a little extra digging. Obviously, price needs to be a factor when you consider the types of model trains and accessories you will get. You can find sets that cost anywhere from $25 to $500. While you do typically get what you pay for, you also don’t have to shell out hundreds of dollars for a good set. The price is also affected by scale type, the size of the set and the prototypes included. Consider, for example, whether you are purchasing the set for a child who is just getting into model trains, or for someone who has been into the hobby for years. This will give you a better idea of an appropriate amount of money to spend. 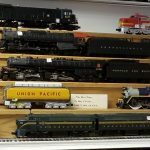 For more information about model trains in Ewing, NJ, contact Trains & Things today.